David’s latest book is Dog Whistles, Walk-Backs and Washington Handshakes: Decoding the Jargon Slang and Bluster of American Political Speech. Written with Almanac of American Politics Co-Author Chuck McCutcheon, Dog Whistles decodes what politicians really mean when they use odd-sounding, insider-ish phrases. 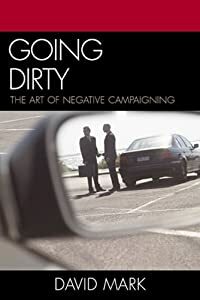 Going Dirty is a history of negative campaigning in American politics and an examination of how candidates and political consultants have employed this often-controversial technique. David‘s book includes case studies on notable races throughout the television era in which new negative campaign strategies were introduced, or existing tactics were refined and amplified upon. Going Dirty has won wide acclaim among popular and academic audiences. Political science professors at Northwestern University, Dartmouth College, Fordham University, Providence College and many more have adopted Going Dirty in course curricula. “The Daily Show with Jon Stewart” featured the book in an interview with David. And Going Dirty was the topic of a “Jeopardy” question. David‘s latest book is Dog Whistles, Walk-Backs and Washington Handshakes: Decoding The Jargon Slang and Bluster of American Political Speech. Written with Almanac of American Politics Co-Author Chuck McCutcheon, Dog Whistlesdecodes what politicians really mean when they use odd-sounding, insider-ish phrases. 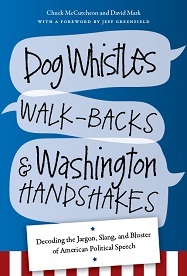 With a forward by author, journalist and television analyst Jeff Greenfield, Dog Whistles will help you keep up your antennae on high alert for intentionally-confusing language by political types of both parties.